The 2010 2nd class self-adhesive from coils of 10,000 continues to sell well on eBay. On his latest blog entry, Paul lists all 67 eBay sales that he knows of, with links to those currently on sale. The highest price, in April appears to be £131.33, while a stamp sold for only £16 in June. Damaged examples have sold for low, but perhaps not low enough prices. There was one earlier one, which we reported, for the whole Sunday Times Wine Club mailshot, which made only £56. dear sir,as a novice ,can i ask if any stamps that have been bought earlier are still valid when the colour changes? i found some blue 2nd class stamps in a relations drawer[1990's??] not many,but can i use them? Yes, all stamps with 1st & 2nd are still fully valid for payment at the current rates. The postage value of the earliest ones (black or orange for 1st, and maybe dark blue for 2nd) has trebled since they were issued! 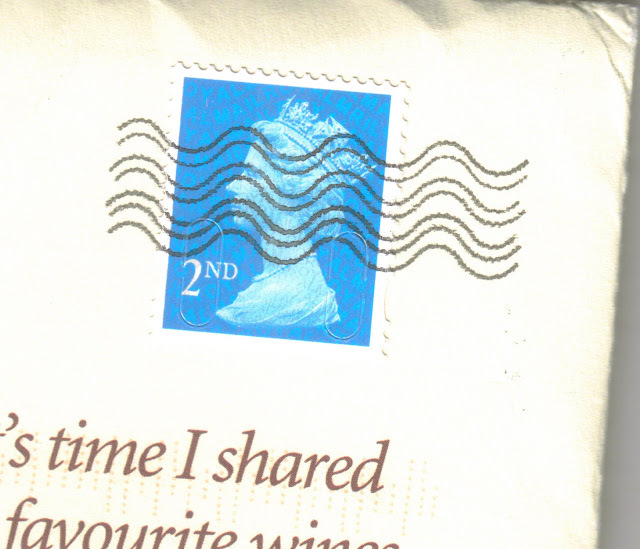 Similarly all decimal stamps and pre-decimal QE2 £1 stamps are valid for postage. Stamps with ½p in the value are OK but the ½p will only count if you use them in multiples of 2.